I must be honest: I used to travel with the same backpack I went to school. Whoops. It wasn’t the smartest decision, I know. But when I started traveling more, I understood this was an investment I had to do for my body and shoulders. Back then, the Netherlands was already my home, and since traveling between one country and another is extremely easy, finding the best travel backpack for Europe was my new quest. Traveling involves a lot of preparation, but still many people (including the old-Bruna) forget to purchase the most important item: a high-quality backpack! Crazy, don’t you think? Buying new gears or clothes for traveling in Europe, won’t make it up for using an old and low-quality backpack, which will only hurt you. A good one will serve you for years and years to come! I need a good travelling backpack. So, what are the best travel backpacks for Europe? That’s what my friends ask me all the time and I give a not-so-satisfying answer: ‘it depends’. Why? Because it depends on what you need it for: are you going on a hiking vacation in a national park or just backpacking in Europe? Are you looking for a carry-on backpack or a main pack that you can check-in at the airport? It looks confusing, I know. But I’m here to guide you and to answer your questions. Below you’ll find all the aspects you should look for in a travel pack for Europe as well as the description of the best backpacks in each category, including the pros, cons, specs, and photos. Note: I divided the first 3 categories by backpacks for women and for men, while the others are unisex. Why should you travel with a backpack to Europe? At first, you’ll spend more to buy your luggage because it has to be of good quality. It pays off to buy a decent backpack because you’ll actually save money by not having to purchase a new one every year, for example. Moreover, some travel backpacks brands I mention below have a lifetime or all mighty guarantee. Backpacks have more pockets, pouches, and stash pockets than a suitcase. These features help to keep your things much more organized and in place, meaning it will be easier to find stuff later. It really is! How? For example, when you’re late to catch a flight and you have to run through the airport. It will make the world of difference if you’re running with a backpack instead of a suitcase. In this comparison chart, you’ll find the most important information about the backpacks I’ll mention below. How to choose the best travel backpack for Europe? There are plenty of backpacks in the market that fall short when it comes to quality and capacity. However, there are many other features you should also pay attention to. 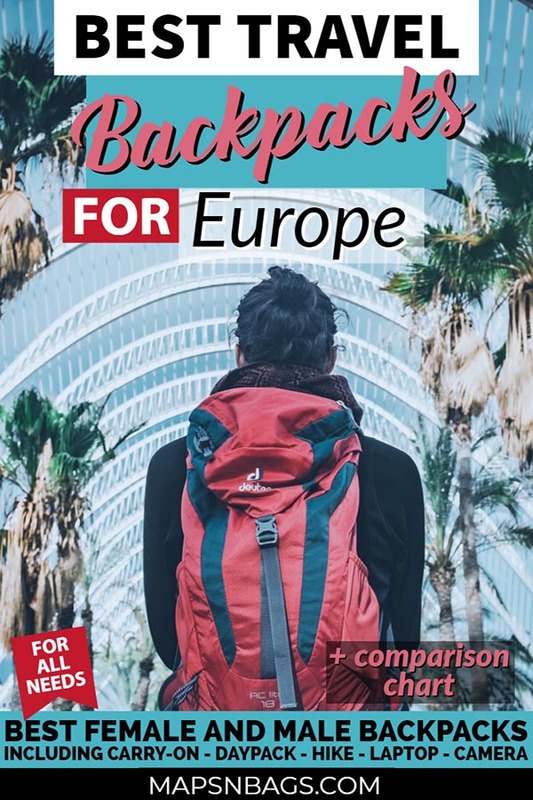 For that reason, I’ve listed the aspects you should take into consideration when choosing your backpack for traveling in Europe that go further than these two characteristics. It goes without saying that quality is fundamental when choosing your backpack. I always say ‘buy better stuff, so you can buy less stuff’. Not only is this good for your pocket, but also for the environment as we produce less waste. Good backpacks aren’t cheap, but I’m sure you don’t want your brand new backpack to fall apart during your trip, right? So again, invest in a decent one that will last for years to come! Moreover, look preferably for water-resistant or at least semi-water-resistant material, such as treated nylon fiber, a lightweight yet thick fabric. Otherwise, a rain cover will already help a lot. There are backpacks of all sizes, but the right one for you will depend on your travel style and how well you can pack. Because if you know how to pack light,you can go on an around the world trip with a 40l backpack only. Seriously! Daypacks should be around 12l-30l. It’ll depend on the kind of trip, gears you’ll need, etc. The ideal size for a carry-on backpack to travel in Europe is between 35l to 45l and – again – it will depend on how well you can pack. If you’re a minimalist one, a 35l is more than enough for traveling around Europe in warm temperatures, but a “normal” size would be a 40l backpack carry on.In the winter, there are some special techniques to choose your clothes, but if you really can’t pack less, maybe you can better opt for backpacks to check-in. So something around 50l-55l should be enough. 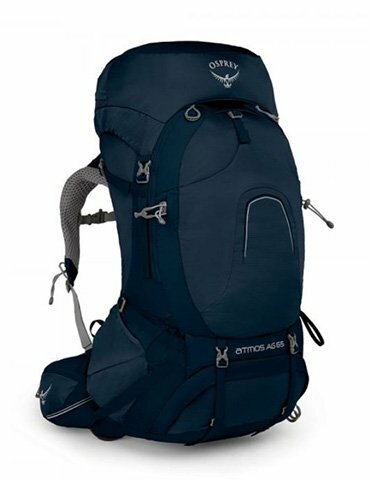 I have the Osprey Farpoint 40l but in size S/M which is actually 38l. This size is ideal for my trips and I have no trouble traveling either by train or airplane (or bus!). 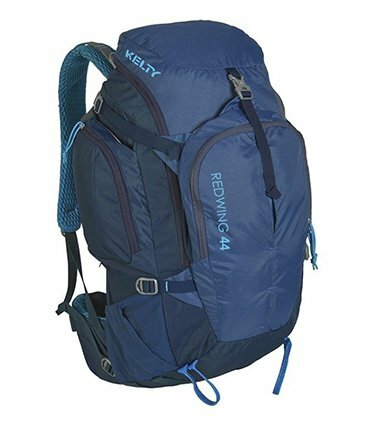 If you’re going on a real hiking vacation and need to take some equipment with you, such as hiking poles and a sleeping bag, look for backpacks around 45L-65L because then you’ll have the features and space you need to attach your stuff.And above 65l? Only if you’re going to camp or trek for a while and need to carry a lot of equipment, otherwise they’re unnecessary. Think about what kind of trip you’re going to take to decide on this one. Are you going on a hiking vacation in the Swiss Alps? Then you need a backpack suited to carry your equipment. Or are you going on a business-leisure trip to London and need your laptop with you? Then you should look for a laptop travel backpack. Or do you prefer versatile wheeled backpacks that you can wear as a backpack on the cobblestones streets of Paris?There are multiple types of backpacks to choose from according to what you really need or the gears you’re considering to take with you. For that reason, I’ve divided the backpacks by different types and specified for which type of trip it is perfect for. There are two ways to access your things and you should look for the one that suits you best. Top opening (or top loading) opens the superior part of the bag and it works better when you’re carrying a laptop, tablet, notebooks, etc. Most backpacks have a top opening and I particularly prefer this one as a daypack because it’s safer. The downside of top loading backpacks is that if you need something that it’s in the bottom, you have to unpack all the rest of your things.On the other hand, a front-loading backpack opens like a suitcase, which means the opening is much bigger and you can easily access everything. I prefer to use this one for traveling because it’s much easier to pack, organize, and find whatever I want inside my backpack. There are two kinds of frames for backpacks: internal and external. I suggest you choose the first one because it usually is lighter than the external frame. Well, actually that won’t be a problem since most backpacks nowadays have an internal frame, but still, it’s important to know that.The external frame is really visible to the eyes and it can carry heavier equipment, however, it decreases your mobility and it can get easily damaged because the frame is sticking out. Note: There are no backpacks in the list below with external frames. The ideal backpack for Europe is lightweight, which means around 1.4 kg/ 3 lbs. It has to be light because you’ll already carry your stuff on your back, can you imagine if the backpack is also adding considerable weight to it? It’s not going work! Actually, to make your life easier you should choose a lightweight version of all your things, from the camera to your shoes. But that’s a subject for another article. A backpack with lots of pockets and compartments helps to keep your things organized and easy to find. This doesn’t mean you shouldn’t use packing cubes anymore though. It just means that packing cubes won’t be the only thing that will keep your stuff in place. Anyway, besides the packing cubes, you’ll also need multiple compartments to pack and unpack in a more efficient way. For example, you might need a main compartment for clothes, another compartment for shoes and accessories, a padded laptop sleeve, pockets for small things, a pocket for your water bottle, and so on. One of the most important features on any backpack is the shoulder straps! Since you’re carrying the whole weight of your clothes and gadgets on your back, it’s essential to have padded and fairly large straps and avoid hurting your shoulders. Also, look for a padded hip belt and a chest (sternum) strap. This will give the support you need to have a perfect weight distribution of your load and not overload your shoulders. I personally suggest backpacks that have a mesh back panel with two vertical ribs of foam to offer some padding and comfort. Moreover, it also avoids your back to get sweaty since the air is circulating between your back and the backpack, making your skin cooler. 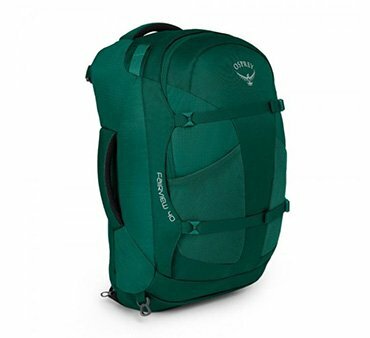 This 40l backpack is lightweight and complies with most of the EU airlines carry-on dimensions. So if you’re looking for budget airlines, this luggage will suit your needs as you won’t have to check in anything.Anyway, the Fairview 40l is front-loading and has a decent internal capacity. The main compartment is spacious, padded on the back with air system holes, and it also has compression straps to keep your packing cubes in place. There is a large mesh pocket on the front flap which is excellent to keep your electronics grid, toiletries bag or dirty clothes organized, for example. The front compartment has a laptop sleeve and another large mesh pocket for documents or a tablet, Kindle, etc. There is a scratch-free pocket for sunglasses on the top of the backpack and two pockets for water bottles in the front, but if your bottle is soft it might squeeze it because the lower compression strap is right on top of it.The shoulder straps and hip belt can be tucked away and you can carry it as a shoulder bag or suitcase.It’s important to note that Osprey has an almighty guarantee! 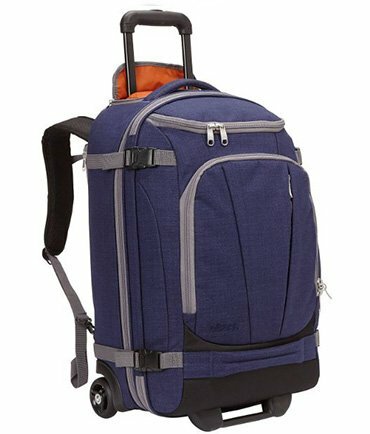 Women who want a versatile carry-on backpack with decent capacity. Women who don’t need many small pockets, just a few large compartments, like when you use packing cubes and your own pouches to pack most of your things. Women who want a really comfortable backpack.Click here to check the latest price and more reviews on Amazon US, Amazon Canada, or Amazon UK! There is one pocket in the lid for small items and a stash pocket in the front which is excellent to hold a lightweight jacket or hoodie. The front compartment has an organizer for mobile phones and maps, while on the external side of its flap, you have a hide-away daisy chain handle to easily move it around.The suspension system of the Kelty Redwing 40l is designed for the female body and it has padded back panel, shoulder straps, and hip belt. The latter can be removed, by the way. It also has a hydration sleeve which can be used as a laptop sleeve because it’s padded too. 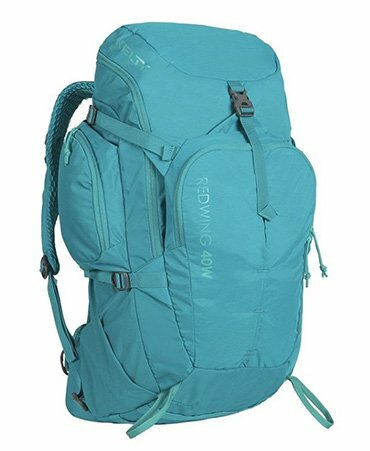 Women who want a comfortable carry-on backpack for travel in Europe, but also want to take it on a hiking vacation. Women who prefer multiple pockets for small items and a top loading backpack.Click here to check the latest price and more reviews on Amazon US, Amazon Canada, or Amazon UK! 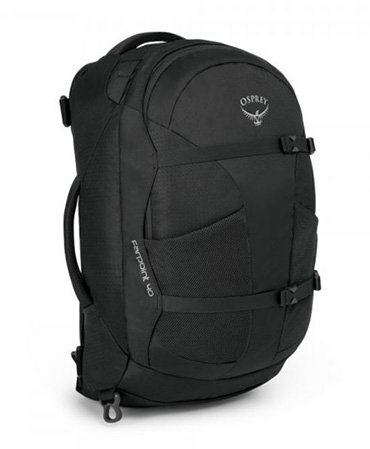 Well, I say it is my choice, but actually plenty of travel bloggers I know also use this Osprey model. The Farpoint is advertised as a male backpack, but I love it. It’s very comfortable.This lightweight 40l travel backpack complies with most of the EU airlines carry-on dimensions. So if you’re looking for budget airlines, this luggage will suit your needs as you won’t have to check in anything. Anyway, the Farpoint 40l is front-loading and has a pretty decent internal capacity. The main compartment is spacious, padded on the back with air system holes, and it also has compression straps to keep your packing cubes in place. There is a large mesh pocket on the front flap which is fantastic to keep your electronics grid, toiletries bag or dirty clothes organized, for example. The front compartment has a laptop sleeve and another large mesh pocket for documents or a tablet, Kindle, etc. There is a scratch-free pocket on the top, which you can use for sunglasses (but I use it for liquids when traveling by plane), and two pockets for water bottles in the front, but if your bottle is soft it might get squeezed because the lower compression strap is right on top of it.The shoulder straps and hip belt are padded and comfortable to wear, and in case you want to carry your Farpoint by the top or side grab handle, you can just tuck away the harness and hip belt. In this case, there’s also a detachable shoulder strap.It’s important to note that Osprey has an almighty guarantee! Men who want a high-quality backpack with great capacity. Men who are looking for a complete, yet comfortable and simple backpack for Europe.Click here to check the latest price and more reviews on Amazon US, Amazon Canada, or Amazon UK! The TLS Mother Lode 54l is durable and amazing to organize small things as it has multiple zippered pockets in the front compartment – which is very spacious, by the way. On top of the backpack, there is a pocket that can be used to keep your carry-on liquids so you can easily access them at the security check.The main compartment is secured by 4 external compression straps and is double zippered. It has two internal compression straps to keep things in place and a small removable divider, to avoid that everything shifts to the bottom of the bag. Still in the main compartment, there is a large mesh pocket on the opening flap to keep dirty clothes, for example, and a removable pouch right on the top of the backpack to keep small items separated and easy to access, such as toiletries.The laptop sleeve is on the back, which offers more safety because it’s hidden. Also, it’s much better to carry it as the laptop’s weight is closer to your body. In addition, there is a small zippered pocket on the front of the backpack for tickets and passports.The adjustable and removable shoulder straps offer support and comfort, although the hip belt isn’t padded. Men who really need a lot of capacity as well as multiple pockets to store small things separately in a carry-on. Men who might be staying in a hostel and don’t want to let the laptop obviously in sight.Click here to check the latest price and more reviews on Amazon US, Amazon Canada, or Amazon UK! The water bottle pocket is easily reached when you’re wearing it, which is a plus compared to many backpacks.It can be either top or front-loaded, you just need to unbuckle the side compression straps to open the front flap almost completely. Inside the main compartment, there is a hydration sleeve which can also be used as a laptop sleeve.Many travelers use the Kelty Redwing 44l as a carry-on, but since it’s a few inches bigger than the carry-on dimensions, there is a risk you’ll have to check it in. So, I added it to the checked backpacks category, just in case. 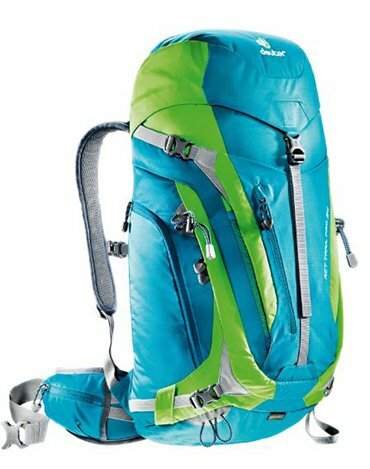 Women who are going on a longer backpack trip around Europe and prefer a backpack with many pockets. 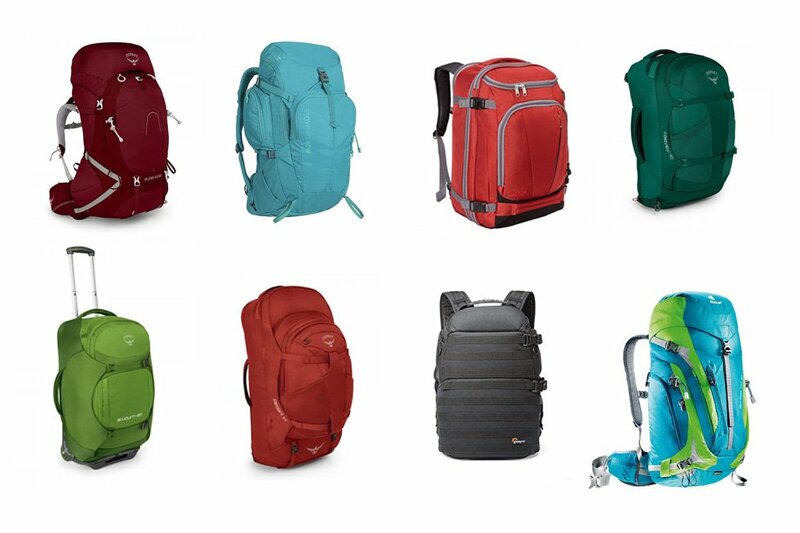 Also, women who want a versatile backpack to be used for hiking trips. Women who want a gorgeous backpack (look at this color! ).Click here to check the latest price and more reviews on Amazon US, Amazon Canada, and Amazon UK! The Fairview 55l has padded grab handles on the top and the sides so you can easily grab your backpack off airport carousels, for example.This panel loading backpack has a spacious main compartment and padded back with air system holes. It also has compression straps in and outside to keep your packing cubes and daypack in place. Yes, it also comes with a daypack. The whole capacity (55l) is actually divided between them. So, the main backpack is 42l while the daypack is 13l, totalizing 55l.The 13l daypack has all the organization you’ll need plus a laptop sleeve and another large mesh pocket for documents or a tablet, Kindle, etc. There is a scratch-free pocket (for sunglasses) and two mesh pockets for water bottles. Yep, this 42l backpack with detachable daypack is a top-notch option because it’s two in one (among others, of course). The daypack can be attached to the main backpack in two ways: like in the photo below, or to the shoulder straps while you’re carrying it (like a kangaroo). It’s important to note that Osprey has an almighty guarantee! 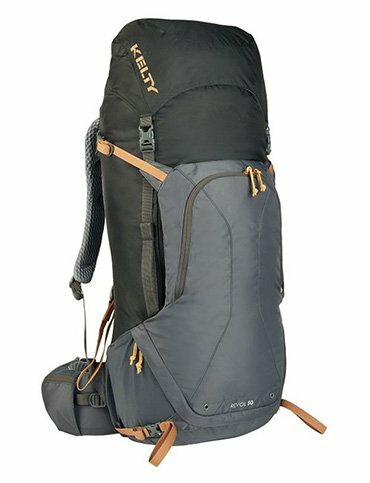 Women who want a versatile backpack for a longer trip around Europe and can’t pack light, or will travel during winter/ cold seasons and need more capacity. Women who could make good use of a daypack too. Click here to check the latest price and more reviews on Amazon US, Amazon Canada, or Amazon UK! The feature I like the most about this model is the detachable 13l daypack. This convenient daypack is secured to the main backpack by two compression straps and a zipper. Like the main backpack, it also has a suspension system on the back with padded shoulder straps and chest strap. This lightweight Farpoint is a front-loading backpack and has a huge internal capacity. The main compartment is equipped with two compression straps and, on the front flap, there is a large zippered mesh pocket perfect to pack your toiletries bag or electronics grid, for example.This backpack is also convertible and you can tuck away the harness and hip belt, and carry it by one of the two reinforced padded handles on the top and on the side of it. Moreover, if you need to lash additional gear to the outside there are multiple daisy chain points to do so.The daypack has a small padded laptop sleeve and a zippered mesh pocket, apart from the scratch-free pocket on the front and two mesh pockets for water bottles.The main backpack is 42l while the daypack is 13l, so 55l.It’s important to note that Osprey has an almighty guarantee! Men who are going on a long trip around Europe, so need the extra capacity. Men who could make good use of a daypack.Click here to check the latest price and more reviews on Amazon US, Amazon Canada, and Amazon UK! The suspension system is excellent and completely padded. The hip belt moves vertically to adjust to your body movements and combined with the lumbar support, it offers great weight distribution and support.Let’s go to the pockets. Well, it has one front pocket organizer, one pocket on and under the lid, two on the sides, a stash pocket on the front and two pockets on the hip belt. Phew! That’s a lot of pockets!The hydration system is great because it’s separated from the main compartment, so if you need to refill it, no need to dig deep to find it.The water bottle pocket is easily reached when you’re wearing it, which is a plus compared to many backpacks. Men who are traveling to cold destinations or going to be on the road for a while and need that extra space. 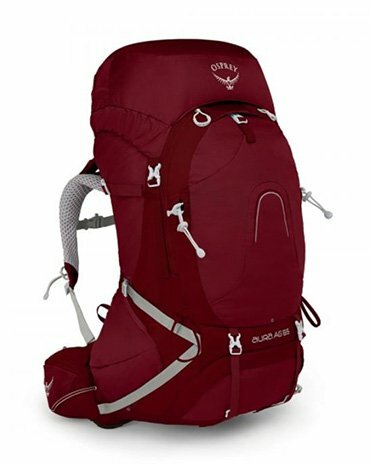 Men who need a backpack for a backpacking trip, but also want a spacious pack for hiking.Click here to check the latest price and more reviews on Amazon US, Amazon Canada, or Amazon UK! This versatile backpack is ideal for trekking and hiking vacations as you can pack all the equipment you need into it, after all, it holds 65l. The Aura AG comes in 3 sizes and it’s very important you choose the size that most adjusts to your torso. The capacity naturally varies in each one of those sizes as it follows: XS 60l, S 62l, and M 65l.There are a couple of zippered pockets on the removable lid to store small items or documents. Of course, without the lid, the backpack becomes a little smaller.There are two frontal pockets and two other pockets on the hip belt.It’s important to note that Osprey has an almighty guarantee! Women who want a comfortable and large backpack especially adjusted to a female body. Women who are going on an adventure trip around Europe (hiking/ trekking). Or women who just can’t pack light (in fact, pack way more than they should) and are going on a longer vacation.Click here to check the latest price and more reviews on Amazon US, Amazon Canada, or Amazon UK! There are six external pockets: two zippered pockets on each side, two on the hip belt, one on the lid, and one on the front for additional space. One internal pocket is also available to store valuables.Besides these pockets and the main compartment, there is a bottom compartment with a removable separator to pack heavy things.One very handy feature of the Deuter Futura Pro is that it has a stretch compartment for wet clothes, so if it rains during your hike you have a place to carry your wet clothes around. 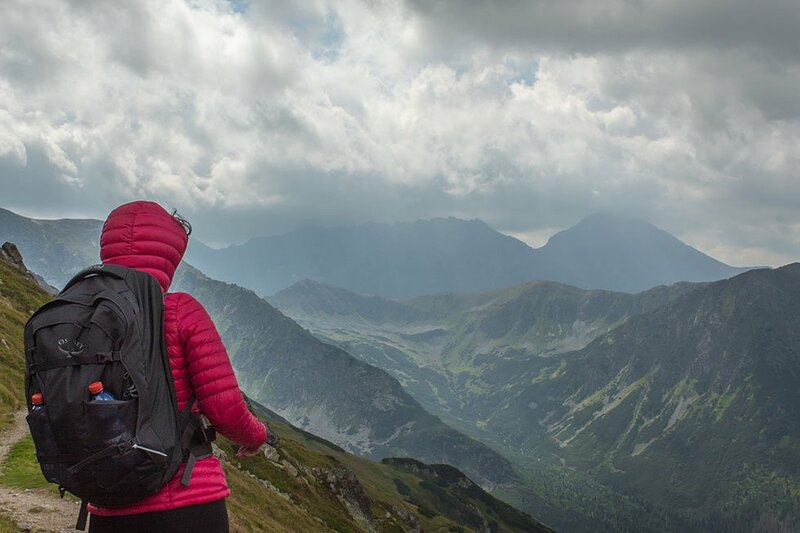 Women going on a short adventure trip, such as a day hike, so don’t necessarily need a large backpack for that.Click here to check the latest price and more reviews on Amazon US, Amazon Canada, or Amazon UK! Moreover, the harness is completely adjustable to your height with a small red cord on the backside, offering impressive load support.The Osprey Atmos AG comes in 3 sizes and it’s very important you choose the size that most adjusts to your torso. The capacity naturally varies in each one of those sizes as it follows: S 62l, M 65l, and L 68l.There are a couple of zippered pockets on the removable lid to store small items or documents. Two other frontal pockets and two pockets on the hip belt compose this backpack.Needless to say that this backpack is ideal for a heavy hiking vacation because it can easily carry your equipment, sleeping bag, gears, clothes, and food. All in one.It’s important to note that Osprey has an almighty guarantee! 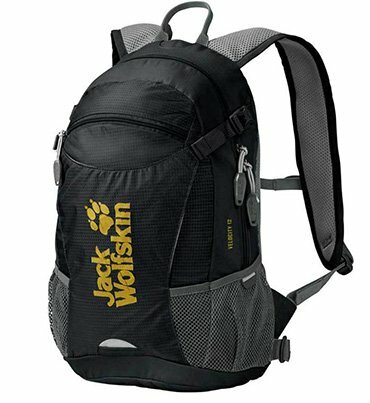 Men who are going on a hiking trip and need a very spacious backpack for plenty of equipment. Men whose torso is long and need a comfortable backpack that fits perfectly. Click here to check the latest price and more reviews on Amazon US, Amazon Canada, or Amazon UK! 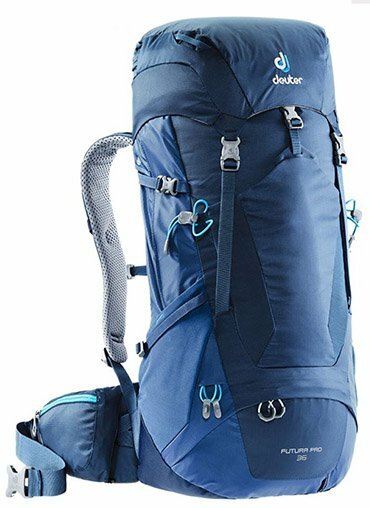 This Deuter has a decent ventilation back system and a fully padded construction making it more comfortable to hike. The shoulder straps and hip belt are also padded. This backpack is top-loading, but there is a zippered side opening to reach lower packed items too. There are 7 external pockets: two zippered pockets on the side and on the front of the bag, two on the hip belt, one on the lid, one water bottle pouch, and one stash pocket on the front for additional space. One internal pocket under the lid is also available to store valuables, for example. 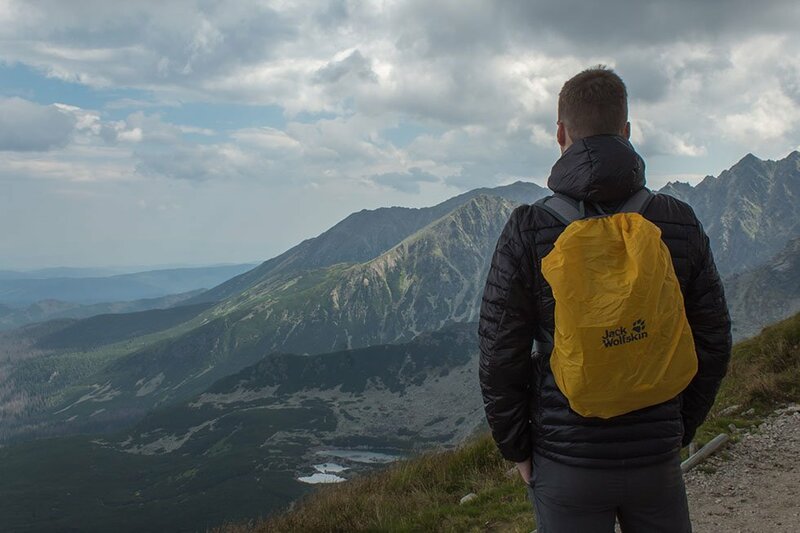 Men who are going on a hiking trip and need a versatile and lightweight backpack.Click here to check the latest price and more reviews on Amazon US, Amazon Canada, or Amazon UK! The Nova 33l has a small front zippered scratch-free pocket for sunglasses, then it has the organizer I mentioned just above, and lastly, it has a main compartment with a large zippered mesh pocket on the front flap, and a TSA approved laptop sleeve in the back. Phew! So many pockets and compartments!So I’d say that the Osprey Nova 33L is the perfect daypack for Europe if you’re planning to bring some gears and office material with you, such as laptop, agenda, travel journal, to name a few. It is hands down the best daypack for Europe, for women of course.It’s important to note that Osprey has an almighty guarantee! Women who want a spacious daypack not only for travel but also to use on the commute and need to carry a laptop as well as lunch, snacks, notebook, etc.Click here to check the latest price and more reviews on Amazon US, Amazon Canada, or Amazon UK! The Nebula 34l has a small front zippered scratch-free pocket for sunglasses, then it has the organizer I mentioned just above, and lastly, it has a main compartment with a large zippered mesh pocket on the front flap, and a TSA approved laptop sleeve in the back. Phew! 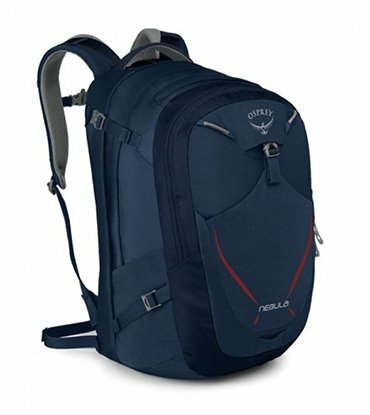 So many pockets and compartments!So I’d say that the Osprey Nebula 34l is the best daypack for Europe if you’re planning to bring some gears and office material with you, such as laptop, agenda, travel journal, to name a few. It’s important to note that Osprey has an almighty guarantee! 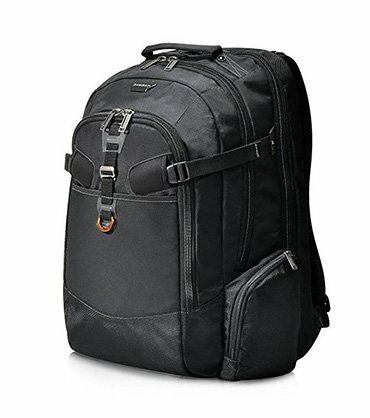 Men who want a spacious daypack not only for travel but also to use on the commute and need to carry a laptop as well as lunch, snacks, notebook, etc.Click here to check the latest price and more reviews on Amazon US, Amazon Canada, or Amazon UK! This daypack has an internal media pocket with cable outlet as well as a padded and fleece laptop sleeve. There is one external zippered pocket with key clip. Moreover, the back panel and shoulder straps are padded to offer more comfort.I know I told you above to run away from a backpack without pockets, but this isn’t the main backpack (and I adore the design). So basically this one will serve you very well as a daypack while traveling and in your hometown.The Herschel Little America is inspired by classic mountaineering packs. This stylish unisex backpack is an excellent option if you want to blend in with locals while traveling in Europe, although I assume it’s pretty common in the US, Canada, and Australia too. 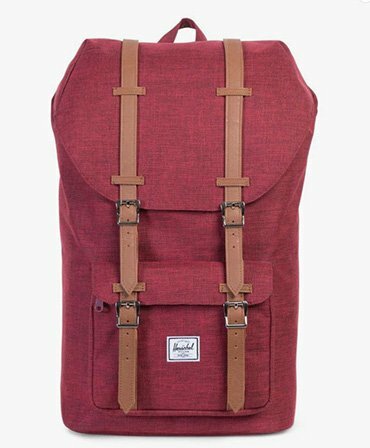 I particularly love the simple design of this backpack. It totally transforms the outfit into a cool street style. People who want a stylish daypack not only for travel but also to use on the commute. People who don’t necessarily need a sturdy backpack with many pockets.Click here to check the latest price and more reviews on Amazon US, Amazon Canada, or Amazon UK! The back is padded to offer more comfort while wearing it. Moreover, you can easily adjust the height of the chest strap by sliding it along the shoulder straps.In the two side mesh pockets, we put our water bottles, which also fit in the helmet sleeve. Yes, helmet sleeve! This daypack is actually designed for bikers, but he uses it as a daypack when traveling in Europe and it works perfectly! People who want a daypack to carry basic things and don’t need extra protection for a camera, for example. People who want a light hiking daypack.Click here to check the latest price and more reviews on Amazon US, Amazon Canada, or Amazon UK! The main compartment is secured by 4 external compression straps and double zippered. It has two internal compression straps to keep things in place and a small removable divider, to avoid that everything shifts to the bottom of the bag. Still in the main compartment, there is a large mesh pocket on the opening flap to keep dirty clothes, for example, and a removable pouch right on the top of the backpack to keep small items separated and easy to access, such as toiletries.The laptop sleeve is in the back, which offers more safety because it’s hidden. Also, it’s easier to carry this backpack loaded with a laptop as its weight is closer to your body. In addition, there is a small zippered pocket on the front for tickets and passports.The adjustable and removable shoulder straps offer support and comfort, although the hip belt isn’t padded. Moreover, there are 3 padded grab handles places on the bag so you can easily grab it out of the trunk, for example. This bunch of features makes the TLS Mother Lode Rolling the best wheeled backpack for travel. People who want the flexibility to choose how to travel. People packing a larger load or just can’t pack light. 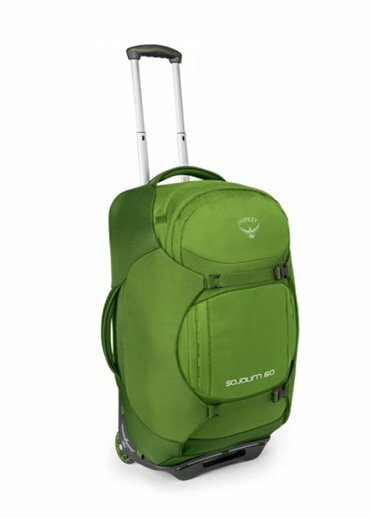 If you’re planning to use it as a wheeled luggage, no problem, but if you do plan to wear it as a backpack I’d only recommend it if you have a strong body structure.Click here to check the latest price and more reviews on Amazon US or Amazon Canada! The Sojourn 60l has a complete zip away torso-adjustable harness, which accommodates multiple sizes of torsos, and a hip belt. The back panel, as well as the shoulder straps, have an air ventilating system with mesh all over it. The suspension system gives you more comfort while carrying it as a backpack.The wheels and chassis are made of durable polymer plastic and can handle almost any surface, proving it’s a good wheeled backpack for Europe and its cobblestones streets. The frame goes all the way around the back of the backpack, forming a rectangle, which stabilizes the bag while you roll it. Moreover, the two-bar-handle can be adjusted in different heights.The main compartment has two mesh pockets on the front flap to keep your electronics grid or dirty clothes, for example. There are two other pockets here, one on each side of this compartment. Now to the compartment itself: It’s really spacious and you can load a lot there, especially because of the compression straps that also help you to keep things organized. Let’s move on to the outside. The Sojourn 60l has several daisy chains and loops on the outside to hang your gear. Regarding the pockets, there is a small top pocket for liquids and small things, for example. People who want flexibility, but yet want to primarily use it as a wheeled luggage. People who are carrying a larger load (or who just can’t pack light). 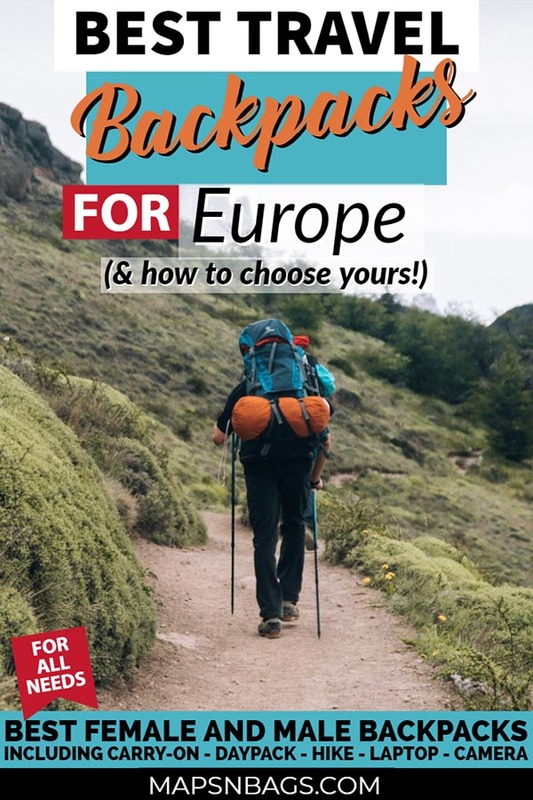 People who plan to go to different kinds of trips around Europe, city trips in general.Click here to check the latest price and more reviews on Amazon US, Amazon Canada, or Amazon UK! 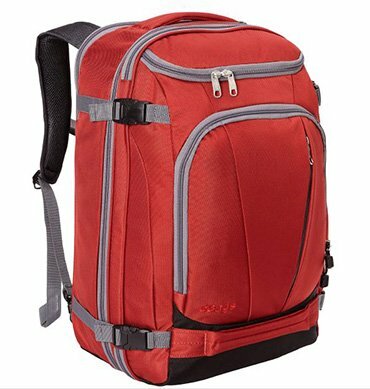 This laptop travel backpack has plenty of pockets, 7 to be more specific. Including a pocket underneath the bag dedicated for shoes, an RFID-safe pocket protected by a lockable zipper, a bunch of organizational features, and a waterproof pocket for a water bottle. Note that this bag is TSA approved, which means you shouldn’t have to remove your laptop at the security check at the airport, although this is completely up to the officers there.The main compartment is big and has no extra pockets to maximize its capacity. Also, this backpack has an interesting slick system in the harness that converts it into a duffel bag. The Nomatic 40l is very functional and if you want plenty of pockets to keep small things organized, this backpack will be an ideal option for you.Well, so much space, it means it’s a large a backpack, which is good, but it can also be annoying because while carrying it as a duffel bag you have to hold it a bit far away from your body. People who are traveling around Europe with electronics and office materials, such as a laptop, tablet, and notebook, and want to protect their valuables with weather resistant and RFID material.Click here to check the latest price and more reviews on Amazon US or Amazon Canada! The front pocket has plenty of organizational features for documents and small items and some space for a small packing cube too or just accessories. The main compartment has a felt-lined sleeve to protect tablets and Kindles. Still in the main compartment, you’ll find two zippered pockets (small and medium) for cables, mouse, and toiletries, to name a few. Here you can put your packing cubes, not many though.The last compartment is in the back and it holds the laptop, also felt-lined. There are two multifunctional pockets on the sides, where you can put your water bottle and a stash pocket on the front.The back panel has a ventilating system and it’s padded as well, as are the shoulder straps, offering more comfort and weight distribution while carrying it totally loaded. People who are going on short trips and need many electronics and gadgets.Click here to check the latest price and more reviews on Amazon US, Amazon Canada, or Amazon UK! This backpack fits 2 pro DSLRs and 6 to 8 lenses. 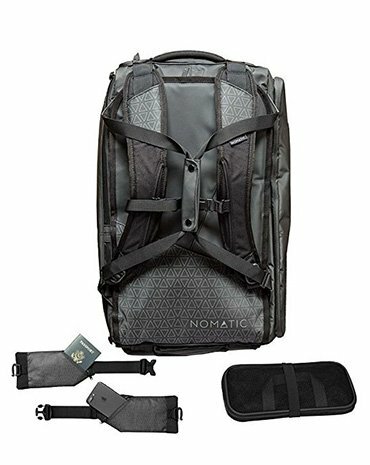 It has a laptop sleeve and it comes with a bottle pouch, tripod cup, 2 cinch straps, and a case that you can use to store your gadgets. The ProTactic 450 AW also fits DJI Mavic Pro drone.There are 6 zippered pockets, 3 mesh pockets on the laptop sleeve, one zippered pocket under the lid to keep memory cards and small things, and 2 pockets on each side of the bag.The padded shoulder straps and the back panel together with the chest straps compose the combo to offer more comfort and weight distribution. 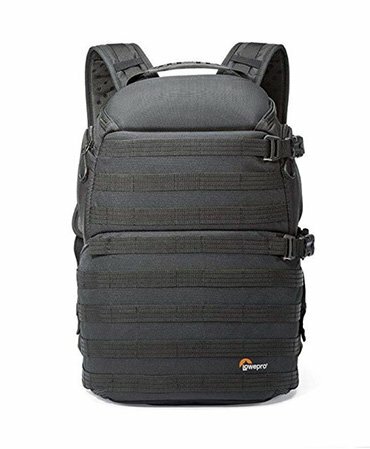 The Lowepro ProTactic 450 AW feels very solid and provides great protection for your gear. It also has plenty of daisy chains to attach your tripod too, for example, but I’d suggest you attach it on the side. Why? Because this backpack opens on the back, so if you attach your tripod to the front you won’t be able to lay the backpack down to open it completely. People who want maximum protection for their photography and filming gears as well as for their laptop.Click here to check the latest price and more reviews on Amazon US, Amazon Canada, or Amazon UK! The lower one has a protective case for the camera which can be removed and used separately. This case can carry a compact DSLR with up to 3 lenses. 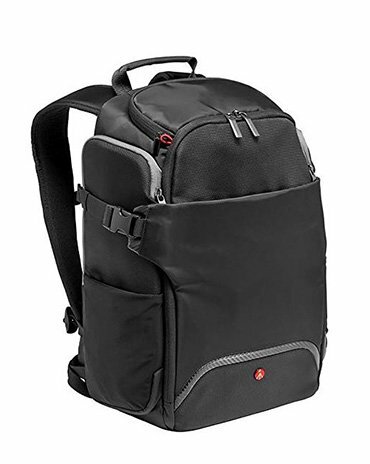 The front pocket has a laptop (13”)/ tablet sleeves.This Manfrotto also feels sturdy and it’s well padded on the back, shoulder straps, and hip belt providing great weight distribution. There are 2 stash pockets in the upper compartment as well as a zippered pocket. The lower compartment has a customizable pouch to organize your photography gears, but if you don’t want to use it as a camera backpack, you can also remove this pouch and connect both upper and lower compartments by unzipping the divider inside. It becomes a daypack then.The Manfrotto Advanced Rear has 4 pouches on the outside, two on each side of the backpack, one of them being a tripod pouch. Moreover, there are two pouches for water bottles. People who want a versatile camera travel backpack for Europe and don’t plan on packing so many gears. Click here to check the latest price and more reviews on Amazon US, Amazon Canada, or Amazon UK! Do you have any questions about these backpacks? Comment below so we can talk! This entry was posted in Travel Gears and tagged Adventure.